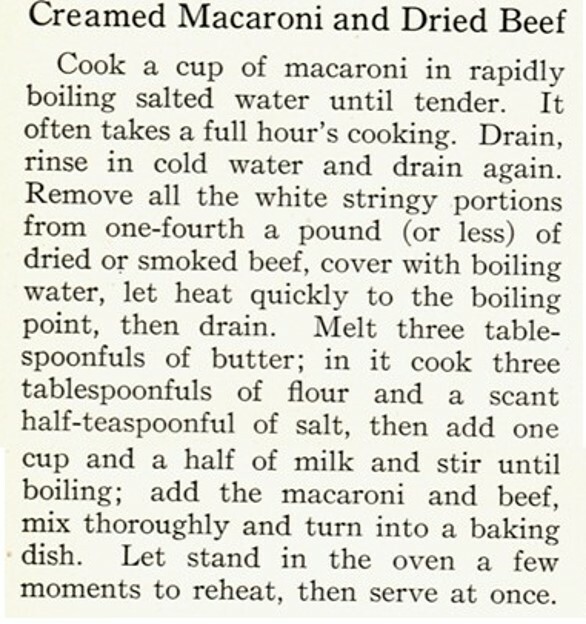 When browsing through hundred-year-old magazines, I came across a recipe for Creamed Macaroni and Dried Beef. This dish has a creamy, rich, white sauce that works perfectly with the macaroni and dried beef to create a comfort food that simultaneously seems both new and old-fashioned. Most varieties of dried beef that are available today are technically chipped beef. I always think of dried beef as a food that the military ate during World War II, but drying meat is historically a good way to preserve it and there are some really good hundred-year-old dried beef recipes. Cook the macaroni in a large saucepan of boiling water until al dente (6 – 8 minutes). Remove from heat and drain. In the meantime, rinse dried beef to reduce the salt content, then drain well. Dice into 1/2 inch pieces. Melt butter in frying pan; then add the diced dried beef and “frizzle” it until the diced beef curls and browns slightly. Stir flour into the dried beef and butter mixture. Slowly pour in milk, and bring to a boil over medium heat while stirring constantly. Stir in the macaroni and cook for 3-5 minutes, or until the sauce has thickened and excess liquid is absorbed, while stirring occasionally. Serve immediately. I did not use salt in the water that I used to cook the macaroni, nor did I add additional salt to the macaroni and dried beef mixture. The dried beef that I used was quite salty–even after I rinsed it, so additional salt was not needed. Posted on May 15, 2016 May 16, 2016 by SherylPosted in FoodTagged dried beef, macaroni, recipe. Previous Previous post: Should whole, 2%, 1%, or skim milk be used in 100-year-old recipes? I think this looks like a good winter dish. Before refrigeration, there was probably a need for many recipes for dried meats. I confess. Stouffers makes a wonderful creamed chipped beef you can find in the freezer section. One package will serve two, or serve me for two meals. Creamed chipped beef on cornbread has been a life-long comfort food. If I don’t have cornbread, it goes nicely on toast, or rice. If a person wanted to get fancy, you could chop up a couple of hard-boiled eggs into it. But! I’ve never had it with macaroni, so this is on the list for this week. It’s going to be rainy and dreary all week, and even though we’re not cold, that’s gloom enough for this kind of dish. Thanks for bringing it back to mind. This dish would be perfect on a dreary, rainy day. I learned something new. I hadn’t realized that a frozen version of creamed chip beef is available. Interesting. . . Dried beef apparently was much more popular in days gone by than what it is now. This looks good!! I love dry beef! I always made a white gravy with it to go over scramble eggs. I’m gonna remember this when I have some dried beef again. I think that you’d like this recipe. . . And, the way that you typically serve dried beef also sounds wonderful. 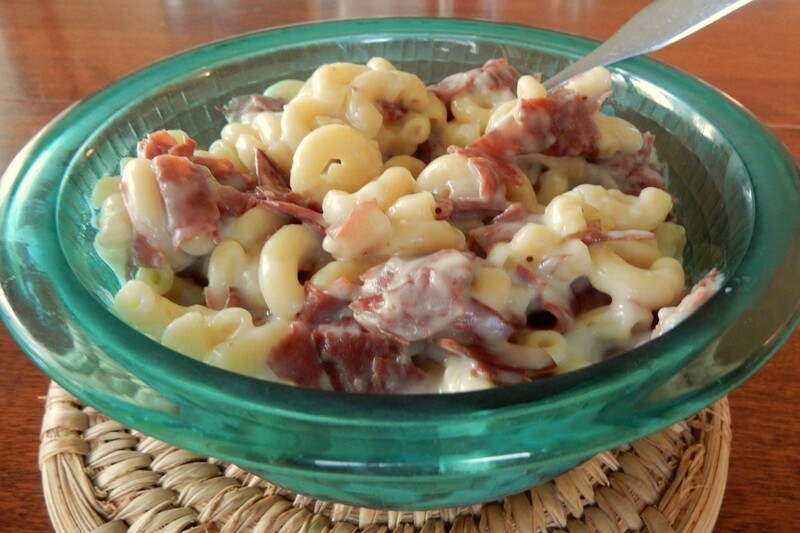 Years ago I had a recipe that included dried beef and macaroni. I had no idea dried beef was still available. Thanks for writing about it. At the store where I shop, dried beef is sold in small jars and is on a shelf near the tuna. Looks very tasty! I think it can also be perfect under the broiler with some breadcrumbs, Mac n’ Cheese style. I like your suggestion. This dish would be lovely with toasted bread crumbs on top. Definitely comfort food. Like the suggestion for toasted bread crumbs. I agree – I also like the toasted bread crumbs suggestion. Interesting how to read how long it took to cook the macaroni a hundred years ago. I also thought that seemed really strange. It seems like the macaroni would be a soggy mess after being boiled in water for an hour. Maybe it was much thicker back then. You’ve really got me intrigued now. I don’t think that I’ve ever eaten anything like this, but it sounds delicious. I’d love it if you found a 100 year old recipe those dishes! The dried beef is so interesting! It would have taken longer to cook pasta on a coal or wood burning stove. To keep it from constantly boiling over they would have cooked it on a spot away from the fire and simmered it. Thanks for explaining how pasta was cooked using a coal or wood stove. The directions in the old recipe make more sense now. Macaroni–check; creamy sauce–check; salty–check! This recipe has it all! I am a complete sucker for this kind of old-school, comforting food. Can’t wait to try it! As a child, we ate creamed dried beef on toast. I have to say I don’t miss it. Maybe I should look at it again as an adult. I recently saw dried beef in bags hanging on racks (like jerky is sold) at the market. What I found very interesting was the statement in the old recipe that it might take an hour for the macaroni to cook. That seemed really strange to me, too. Can you imagine what modern macaroni would look like if it was cooked in boiling water for an hour? I love the green bowl–I have one in the same design in cobalt blue. It is a lovely bowl. Cobalt blue sounds really pretty, too. The bowl in the picture is one of three nesting bowls in a set that I got as a gift a number of years ago. How true! I like how you describe dried beef. How about adding bacon bits. yum, too. mmm. . . that would be a nice addition. Dried beef…. Jerky, yes? How interesting. Gotta try this one very soon! They are slightly different. Both are dried beef, but I think that jerky tends to be spicier. Dried beef is sliced very thin, and used for sandwiches and in recipes; jerky often is packed in individual servings and is eaten by itself as a snack.